About a month ago some friends and I were talking about how it would be fun if we got together for a monthly dinner party. Maybe a party with a theme in the food. Then we talked some more. Finally, one person (not me), contacted everyone, determined the theme for the first dinner and all the rest of us had to do was figure out a day that worked for everyone. The theme was beer. I feel like one of the only people in the world who doesn't like beer. I like hard cider. I like hard lemonade. But beer? It's not sweet enough for me. How can a person get through college without beer? By drinking amaretto stone sours, white russians and 'jungle juice.' Now that I'm all grown up (or something), I've graduated from white russians to mojitos and wine. But still, no beer. So I wasn't sure how this food challenge would play out. But one thing is obvious. I love dessert. Still, in scouring through Allrecipes.com and Foodbuzz I didn't really see anything that really jumped out at me. So I put my project in the hands of google, which took me to a site called Yummly, where I found this recipe. It is a winner. Warning: Your house will smell like Christmas when you bake these. Preheat over to 350. Line muffin tray(s) with liners. Bring Guinness and molasses to boil in heavy medium saucepan over heat. Remove from heat; stir in baking soda (when you add the baking soda it will bubble and froth, so a medium pan is better than a small one unless you want it to bubble over everywhere). Let stand 1 hour (or put the pan in the fridge to cool faster, which was my technique). Whisk flour through nutmeg in a large bowl to blend. Whisk eggs and sugars in a medium bowl to blend. Whisk oil and then Guinness/molasses mixture into the sugar mixture. Gradually whisk stout-egg mixture into flour mixture. Divide batter among liners. Bake until toothpick comes out clean, about 25 minutes (this was the original time and I kept to it pretty close even with the Colorado altitude). I did notice that the cupcakes were a little concave after baking. However, that dent becomes a bonus Cream Cheese Frosting holding area...so it all worked out. In a large bowl using an electric mixer, beat cream cheese, butter and vanilla until creamy. With the mixer on low, beat in powdered sugar, 1/2 cup at a time. Then increase speed and beat until light and fluffy. Frost on cooled cupcakes and garnish with a sprinkle of nutmeg. Eat shamelessly until gone. Nothing like a wonderful spicy fall cupcake! 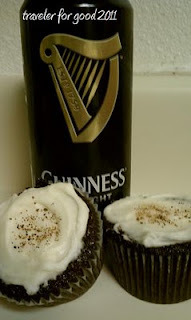 The use guinness and molasses says fall to me! Those ingredients combined with the spices no doubt is delicious. Also, love the extra bonus of your house smelling like Christmas!